Studies show that art classes help students succeed academically, but when budgets are tight, they are often the first courses to go. 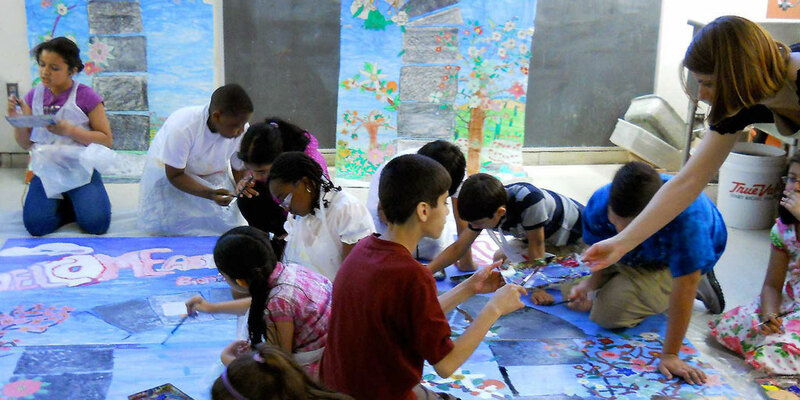 This is where the Lehman College Art Gallery steps in, now providing supplemental instruction for area schools through its K-12 Art Education Program, in addition to existing community art programs. The Gallery’s workshops are available to all New York City public schools and are designed to foster an interest in contemporary arts. Participants take classes in public-art making; learn to work with ceramics, tiles, and textiles; and take tours of the Gallery exhibits. Teachers, in turn, learn how to integrate art into their curriculum. In addition to the K-12 programs, the Gallery offers many programs that are free for students and their families. One such opportunity is the Family Focus Program, where participants are invited to complete craft projects together, including hand-painted paper collages and multimedia flower bouquets. The Gallery also has complimentary services for Lehman College students including tours for classes, open houses, and special events. Visitors to the Gallery can now see the exhibits “The Art of War” and “Alien Nations.” Commemorating the centennial anniversary of World War I, “The Art of War”features original propaganda posters from both WWI and WWII. “Alien Nations” features various artists exploring how societal instability affects people’s psychological states and feelings of isolation and anxiety. For more information on the exhibits and events at the Lehman College Art Gallery, visit http://www.lehmangallery.org.